Camber: This is the term for the depth of curvature in a sail. Camber is expressed as a ratio (A/B), so a sail which has a measurement of 10 feet from luff to leach and a depth of curvature of 1 foot is said to have a camber of 1/10. Therefore, the deeper (fuller) the sail is, the greater is its camber. Position of camber: This term describes the distance aft of the luff that the greatest depth of curvature occurs. For example, a sail which has its greatest depth of curvature 3⁄10 of the way aft from the mast would have a position of camber of 30%. Twist: This term describes the differences in sail angles at varying heights above the water. If a sail is set exactly on the centerline of the boat at the height of the boom and the angle of the top batten is 25 degrees off of the centerline, the twist of that sail is said to be 25 degrees. Attach sheets to the center hole (or one up from center) of the clewboard. Tension luff only barely enough to almost, but not quite, eliminate horizontal wrinkles. Jib car in line with board slot. Sheet tension: sheet until the third batten from the top is parallel to the centerline of the boat. The second batten will be pointing outboard. Tension luff to eliminate horizontal wrinkles. Sheet tension: sheet until the second batten from the top is parallel to the centerline of the boat. Attach sheets to the hole one up or two up from center of the clewboard. Jib car 15″ to 16″ off centerline in rough water, but eased out as necessary to avoid backwinding the main if you are in smooth water and have eased the main traveler. Sheet tension: sheet until the third batten from the top is parallel to the centerline of the boat. Sheet tension: Sight top batten parallel to centerline of boat, or about 12″ to 18″ off backstay. Traveler carried 14″ to windward at 0 mph, to center at 6 mph. Outhaul in 1 1/2″ from black band. Sheet Tension: More firm. Sighting top batten, maintain it 12″ off backstay. Outhaul 3/4″ in from black band. Sheet Tension: Very firm. Top batten 18″ off backstay. Traveler on center to all the way out in big puffs. There are three elements that must be optimized to result in the best speed made good to windward: Speed, Pointing, and Low Leeway. You can maximize two of the three by sacrificing the third. 2) After completing a tack, especially under a lee bow. 3) After hitting a large wave. 1) When someone tacks on your lee bow. 2) After you have acquired speed after tacking on a lee bow. 1) Upwind – the leeward board should be all the way down. It should not be necessary to bring the board up to reduce weather helm in strong air, since the degree of helm should be controlled by other means. The windward board should, of course, be up at all times. 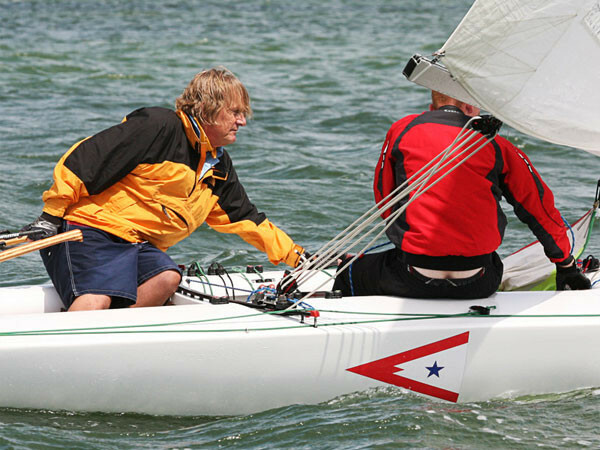 2) Downwind – the leeward board should be 25-50% down. The windward board should, of course, be up. Fore and Aft: It is important to avoid sailing with the transom buried. With a heavier skipper and a lighter crew it is easy to have the balance too far aft. As a result, attention must be paid to keeping your weight forward if at all possible. As the air increases or in larger waves, it can be beneficial to adjust your weight further aft. As the air decreases or in smaller waves, it is beneficial to adjust your weight further forward. Laterally: Regardless of the point of sailing, the I-20 should normally be heeled such that the leeward board is vertical in the water. This occurs when the lower edge of the rubrail is at the water surface. Decrease heel in gusts or when attempting to initiate planing, and increase heel in lulls or when attempting to cross through a large wave. Note that this is exactly opposite to what is easy to achieve!